SNTechnology distributes IT Products in Cape Town HDMI Cables, HDMI Splitters, HDMI Switches, HDMI Extenders, HDMI Converters, HDMI Adapters. 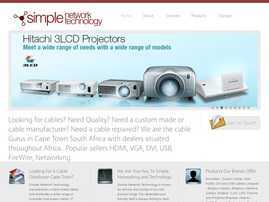 Brateck Bracket Technology Distributors - Projector Ceiling and Wall Mount Brackets, LCD Brackets, LED Brackets, Plasma Brackets, Desk Brackets, Monitor Brackets. VGA, USB, FireWire, Networking, KVM, AV Systems and More!